(CIFA):The strong winds in West Bay this Saturday made conditions very difficult for the ladies who took the field at Ed Bush Sports Complex. 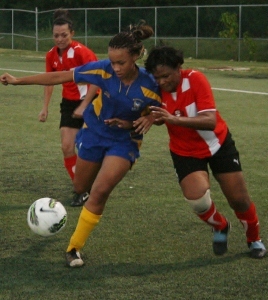 Scholars International Ladies team picked up their first win of the season with a 1:0 victory over Future Sports Club. Scholars played with the wind during the first half and on the stroke of half time Scholars Sheila O’Connor created a chance from nothing, after closing down Future’s defense and stealing possession, she took on two Future defenders before lobbing the keeper from an acute angle. The finish itself was worthy of winning any game. O’Connor’s goal left Future stunned and they came out in the second half with the wind behind them looking for a way back into the game. Future looked comfortable in possession but failed to create any clear cut chances in front of goal. Jetena Bodden marshaled the Scholars defense with authority and broke down any threat posed by Future. Scholars win was fully deserved as they held out to take their first three points of the season. The other match up on Saturday evening saw Elite Sports Club maintain their 100% winning record in the Women’s league by downing George Town SC ladies 5:0. Brianna Hydes scored twice for Elite along with Chelsea Brown, Shanice Monteith and Elite SC and Cayman Islands U20 Captain Jessica Ebanks who converted from the penalty spot.